Bullsh*t Rumor of the Day: The Moto 360 is Now Made of Plastic! That’s how Motorola’s Cathay Bi describes the Moto 360 in the opening 30 seconds of a video filmed to showcase their upcoming smartwatch during Google I/O. Why am I bringing that point up again today? Because the tech industry is bored today and passing around a rumor from a Korean news outlet that is suggesting Motorola is ditching the metal and going with plastic in the Moto 360. And also because a number of readers pinged us with concern. Does anyone really believe at this stage in the game that Motorola has decided on plastic instead of stainless steel? They were showing off both working and demo units at Google I/O that were made of metal. When they announced it, they said “metal.” A metal finish or “premium material” is one of the key selling points of the watch. In fact, there are two major design ideas here – 1) The Moto 360 is round and looks like a classic time piece. 2) It’s made of metal and leather, premium materials. But now, it’s plastic? Sure! On a related note, today’s rumor of the day is also suggesting that the Moto 360 has somehow grown since we last saw it to add in wireless charging (except we already knew it had wireless charging). In other words, the rumor-du-jour says that the Moto 360 is all sorts of thick at 13.5mm, almost 4mm thicker than the G Watch. 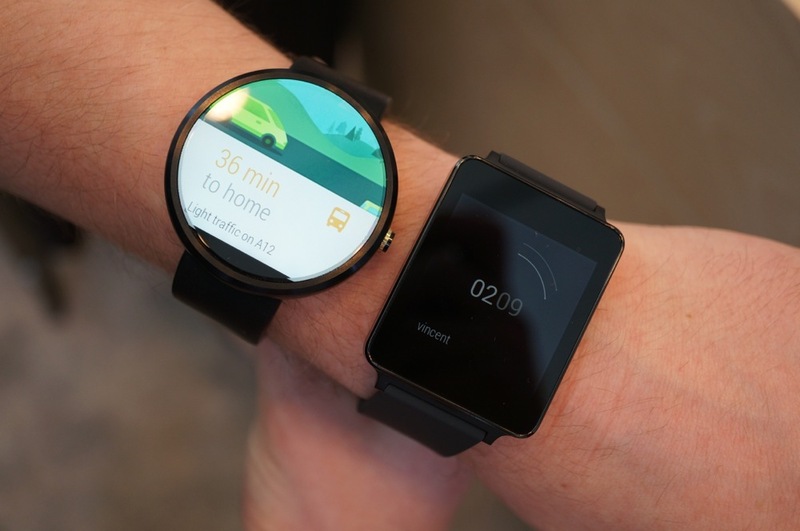 I will just say this – Motorola hasn’t given us specs, so we don’t know how thick the Moto 360 is. What I do know is that Tim and I put the 360 on wrist, right next to the LG G Watch, and at no point did either of us say, “Whoa! You thick, boy!” Nope, we just thought it looked and felt awesome, especially next to the bland, black G Watch. Look, we know that the world is excited about the Moto 360, but let’s not get all crazy about the rumors. Until Motorola changes their official 360 site or announces something other than what they have told us time and time again, assume that nothing has changed.